The team members come from Italy, Germany, the USA, China and many other countries. Yet everyone is working on the same project. How is that possible? Christina Messner, Global Director Quality Systems, is already working in this kind of team on the Smart Quality project. We asked about her personal experience with managing virtual teams, and what Smart Quality project entails. 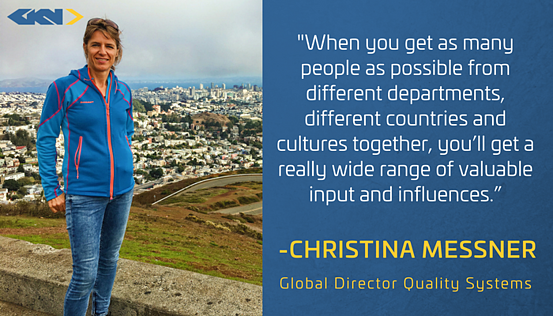 Christina, could you first briefly describe your career at GKN? I have been with GKN for almost exactly 19 years now. Since 2015 I have held the position of Global Director Quality Systems. So, what do we do with the data that our software systems provide us with? This is why we now have the Smart Quality Project. And what exactly is Smart Quality? In a nutshell, Smart Quality means using the incredible quantity of data collected to improve our quality and control it in the most efficient way possible. We use many systems that generate unbelievable quantities of data. Smart Quality is designed to help us with the analysis of this data so that available resources are used in a way that our efficiency and quality are significantly improved. What role do you play in this project? I am responsible for defining individual part-projects. I defined the structures of the project, working together with our Senior Vice President Peter Boultbee. What are the main topic areas? Where do you want to start? Of course these are all things that happen in a team, so I don’t want to mark myself out particularly. We have a fantastic team working on the project. How did the team come together, and what was the starting point for the whole project? First of all, the team was defined completely from scratch, and diversity plays a central role in this for me. The more diverse, the better. When you get as many people as possible from different departments, countries and cultures together, you’ll get a really wide range of valuable input and influences. Without, of course, neglecting the competency of the members (laughs). What is it like managing high-performing virtual teams? Thanks to this digital age, it actually works very well. We can be in touch in real time via many of GKN’s portals, which simplifies things immensely. As far as communication goes, we have regular calls where the team exchanges information and ideas. But despite all the digital aids, it’s still nice for the team to meet in person occasionally. You should never underestimate personal exchanges of views. Were there any challenges that you had to overcome as a global team? The first challenge is obviously to find a time when everyone can dial in to a conference call! Because of the different time zones, you do sometimes have to make a compromise, and perhaps stay a few hours longer in the office. 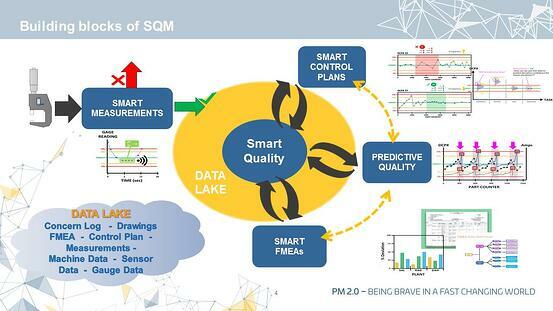 Another challenge was conveying a joint understanding of Smart Quality to everyone. When you have a team made up from different departments such as Sales, Quality, Engineering, etc., everyone brings a different technical perspective to it. That’s why, in this process, no question is ever a stupid question. In our conference calls we discuss and explain things, and ask questions. That’s really important. It can also be helpful not to rely too much on text, but to work mainly with images and graphics. The more diverse the team, the better - a team from different departments brings a broad technical perspective. No question is a stupid question - asking questions, explaining things and discussing answers is really important. Have regular calls to exchange information and ideas. Make compromises due to the different time zones - prepare to stay in the office a few hours longer than usually or come earlier now and then. Now and then, get your team together and meet live at a location that connects all of you. Don't work with too much text - but with images and graphics.